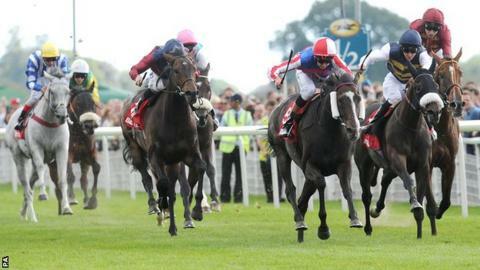 Johnny Murtagh's 20-1 shot Mutual Regard produced a stunning finish to win the Ebor Handicap at York. Jockey Louis Steward kept his mount handily placed behind Dare To Achieve, who made much of the running in the coveted one mile and six furlong race. Steward eased ahead inside the two-furlong mark and saw off second placed Van Percy by a length and a quarter. Elidor was third and favourite Pallasator was fourth from his wide draw in stall 22. Teenager Steward said: "It's amazing, and I'd like to thank Mr Murtagh and [owner] Mr [Andrew] Tinkler for giving me the opportunity. "At such an early stage in my career it's such a privilege to ride in a race like that. "Mr Murtagh just said, 'don't worry where you sit, just get him to settle'. Luckily they went a nice gallop. I probably hit the front a bit too soon but when the horses came to me he really quickened. Murtagh said: "This lad had been going well at home. I thought a fast pace and one-mile-six would suit him, and Louis gave him a lovely ride. "I wanted Ross Coakley to ride but he's suspended - Andrew looked at the stats and said this lad [Steward] is red hot." Who will shine on Ebor stage?